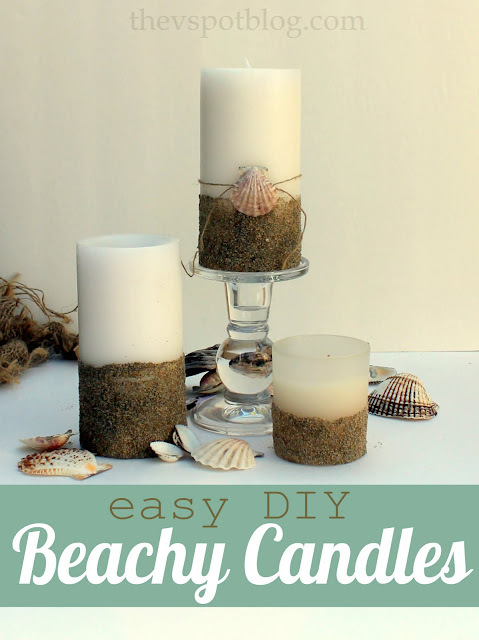 Give plain pillar candles a beachy look with sand and seashells. I have a beachy 5 minute craft for you today. 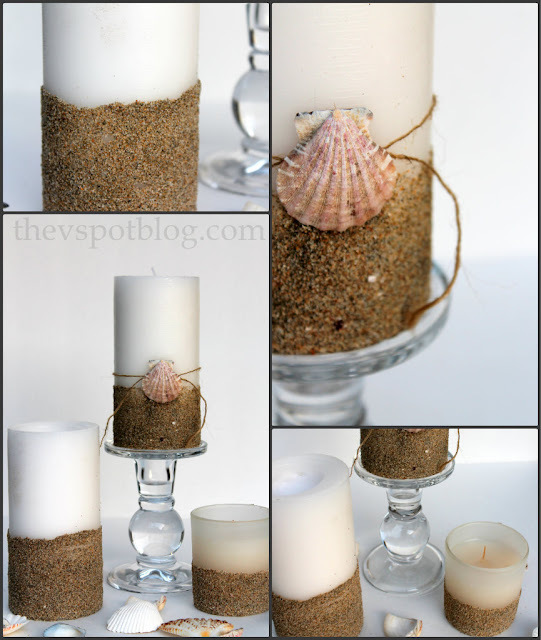 Update plain, boring pillar candles with sand and seashells. These would be perfect for a beach themed wedding or just casual summer time dinner with friends. I am fortunate enough to live near the beach and can get all the sand I want. (Heck, if I was really desperate I guess I could just sweep it out of my car!) If you aren’t near the beach, don’t worry! You can buy bags of sand at any hardware or garden store. 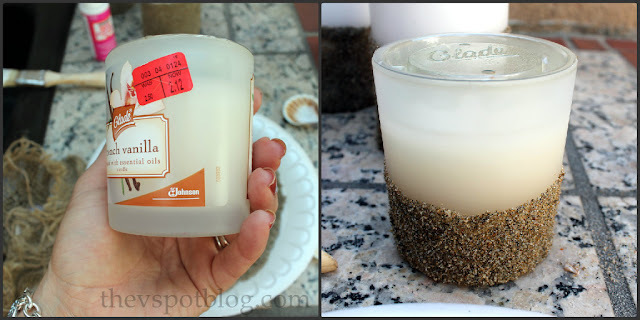 You’ll need a few candles, some Mod Podge (or plain glue like Elmer’s ) a paintbrush and sand. Seashells and twine/burlap are optional. Brush glue around the bottom third of the candle, then roll it through the sand. You can cover as much of the candles as you would like. It’s totally up to you. This also works great to jazz up boring little jar candles. This was an easy fix. I just peeled off the labels and price stickers (Target Clearance! Hollah!) and painted on the glue/rolled the jar in sand just like the pillars. Tap the candle to release any excess sand and let it dry. Easy, cheap, and less than 5 minutes. Yay! Very clever! I love a craft with big impact and little expense. How did you get the shell and twine to stay on the candle? Thanks for your question, Mary. I tied the twine and then a little dab of glue held the shell. Faux Red Coral made from sticks & spray paint.